With Toyota getting hosting rights to the 2020 Olympic games last year, it's not surprising that Toyota Motor snagged a new category of partnership with the International Olympic Committee. Toyota on Friday announced a global agreement to become mobility-category IOC partner, a deal that runs through the end of 2024. The agreement puts the automaker in a new IOC sponsorship bucket focused on vehicles, mobility services and mobility solutions. More specifically, the sponsorship focuses on sustainability, and revolves around what one can expect will be Toyota's lineup of hybrid and electric passenger cars; urban vehicles and commercial vehicles; services like vehicle and road safety and transportation support systems; and certain transportation and mobility support products. At a ceremony on Friday in Tokyo were IOC President Thomas Bach, IOC Marketing Commission Chairman Tsunekazu Takeda (Japanese Olympic Committee President), The Tokyo Organizing Committee of Olympic and Paralympic Games President Yoshiro Mori, Toyota President Akio Toyoda and other Toyota and IOC dignitaries, per the company. Toyota gets sponsorship rights in Japan through 2016, and the year after, Toyota's marketing rights go global. Said Toyoda, in a speech, "The addition of a mobility category to the TOP Partner field is an important recognition for our entire industry." Toyota is actually the second Japanese brand (tire maker Bridgestone was first) to jump into the Olympic pool since the Tokyo 2020 deal was announced. In 2013 Audi replaced Mercedes-Benz as official auto supplier, a partnership the latter had owned for over two decades. Audi's four-year deal makes the automaker vehicle brand for the IOC's headquarters in Lausanne, Switzerland and the organization's international events. Audi has had separate relationships with the Olympic organizations in Russia, Switzerland, and Germany, so one deal doesn't keep others out. Volkswagen was official vehicle at the Sochi Winter Olympics last year. In 2012 BMW had a huge sponsorship presence in the Summer Olympics, thanks to a deal, including vehicle fleets, with the London Organizing Committee for the Olympic Games. 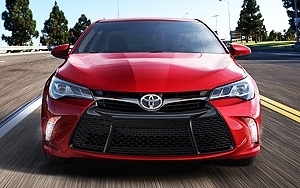 In the U.S. Toyota has a partnership with the Special Olympics World Games Los Angeles 2015 in July.